Judy May Chu was born on July 7, 1953, in Los Angeles, California, to parents of Chinese ancestry. She earned a B.A. in mathematics from UCLA in 1974, and a Ph.D. from the California School of Professional Psychology in 1979. Chu subsequently served as a psychology professor at East Los Angeles College from 1981-88, a board member of the Garvey (California) School District from 1985-88, and a Monterrey Park City Council member from 1988-2001. In 1982 Chu became an Interim Executive Committee member of the now-defunct Federation For Progress (FFP), a Marxist united front organization created by the highly militant Communist Workers Party (CWP). According to author/blogger Trevor Loudon, CWP not only “followed the policies of Mao Tse Tung, Joseph Stalin and … Pol Pot,” but also “originally gave some support to the Islamists of the Iranian Revolution.” Another notable FFP Committee member was the late Manning Marable. When CWP in 1985 changed its name to the New Democratic Movement and began trying to infiltrate the highest levels of the Democratic Party, Chu remained loyal to the group’s agendas. As Trevor Loudon explains: “The CWP never abandoned Marxist revolution as its goal. It merely exchanged the subtle long-term infiltration of the institutions as recommended by Italian Communist Party leader, Antonio Gramsci, for the outdated, confrontational street-marching tactics of Mao Tse Tung.” Specifically, the new strategy sought to achieve power by exploiting racial and ethnic divisions. Chu demonstrated her allegiance to this approach in 1986, when she opposed a Monterrey Park City Council resolution endorsing English as the nation’s official language. Chu served in the California State Assembly from 2001-06, and on the California Board of Equalization from 2006-09. In 2008 she initially supported the presidential campaign of Hillary Clinton, though she later shifted her allegiance to Barack Obama when the latter secured the Democratic Party’s nomination. In June 2008 Chu co-organized a Los Angeles event where Communist Party USA leader Evelina Alarcon presented an award to Obama’s younger sister, Maya Soetoro-Ng. In a special election that was held on July 14, 2009, Chu won the race to represent California’s 32nd District in the U.S. House of Representatives. She continues to serve in Congress, though in 2013 her district was renumbered as the 27th. Chu is a member of both the Congressional Progressive Caucus and the Congressional Asian Pacific American Caucus. In 2012 Chu was a national co-chair of Obama For America (later known as Organizing For America), whose mission was to engage and mobilize pro-Democrat voters in all 50 states. Chu rejects the use of the term “anchor baby” in reference to the offspring of illegal aliens who give birth in the U.S. so that their children can claim American citizenship and all the social-welfare benefits that go with it. This “slur that stigmatizes children from birth,” says Chu, is a repugnant outgrowth of “xenophobia” that aims to “isolate immigrants.” What is most needed, the congresswoman explains, is “comprehensive immigration reform” that: provides a “pathway to citizenship”; fixes “a broken immigration system that forces families to live apart or live in fear”; and “integrate[s] the 11.5 million undocumented immigrants already living and contributing here.” “Our government should not be in the business of separating parents from children,” Chu emphasizes. 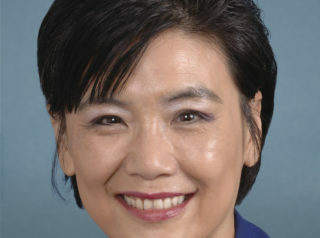 In December 2014, the House Ethics Committee issued a letter of reproval to Chu, scolding her for (a) unlawfully requiring staffers to perform campaign-related work in her House office during regular working hours — and thus at taxpayer expense, and (b) subsequently interfering with the investigation that sought to determine what had occurred. In September 2016, Chu argued that illegal aliens should be permitted to purchase healthcare plans through the Obamacare exchanges. For details about Chu’s overall voting record on a variety of key issues, click here. For additional information on Judy Chu, click here. Further Reading: “Judy Chu” (Ballotpedia.org, Votesmart.org, Keywiki.org); “Judy Chu, and the Communist Front ‘Federation For Progress’” (TrevorLoudon.com, 2-15-2013); “Yes Soledad O’Brien, Judy Chu Probably ‘is a Communist’!” (TrevorLoudon.com, 2-12-2013); “Judy Chu and Communist Worker Jose Zapata Calderon” (TrevorLoudon.com, 2-12-2013); “‘See Something Say Something’? Not So Fast, Says Congresswoman Judy Chu” (Breitbart.com, 9-3-2011); “Muslim Witch Hunts” (by Daniel Greenfield, 9-4-2012); “House Ethics Committee Scolds Congresswoman Judy Chu” (SCPR.org, 12-11-2014); “Democratic Lawmaker Wants 10 Times As Many Syrian Refugees Admitted into the U.S.” (Daily Caller, 8-29-2016). “Dem. Rep. Chu: ‘Anchor Babies Is A Slur’” (by Caroline May, 8-25-2015); “Rep. Judy Chu Responds to Comprehensive Immigration Reform Legislation” (4-17-2013); “Rep. Chu Statement on Third Anniversary of DACA” (6-15-2015); “Rep. Chu Criticizes Texas Court Order to Halt Immigration Executive Action” (2-18-2015).